Hi there, how's your photography during winter season? Have you caught already beautiful landscapes covered with snow? If so, I envy you. Here greyish, rainy and windy days is not encouraging outdoor photography. Although, one such long afternoon inspired me to try technique called "Light Painting". I suppose most of you know or have heard about this technique. In short, the idea is about using a moving light source while taking a long exposure time photos. However, I do not mean painting fanciful abstracts or words in the air for artistic purposes, but applying this technique to product photography. The light source for light painting can be various, from candle to lightsaber :) For product photography the light must be more directional so that we can selectively illuminate only those shapes that we want. Smartphone's screen will fit to this perfectly but first we should install some simple free app. I use the "Screen Flashlight" on Android (you will also find equivalents for iPhone). This app allows to set screen as light emitter in any color you wish. Personally I used mostly pure white. You may as well try it with tablet, better for larger size objects. Items such like camera lens or other highly reflective stuff, require some preparation. The room must be completely shaded, the back wall must be far enough away so that the light does not reflect on it. You can possibly use something from your wardrobe, black coat, t-shirt and so on. If you are sure that any unwanted lights will not disturb our darkroom, we can go to the settings and compositions. Set the camera on a tripod, change focus to manual mode and compose the frame before we turn off the light. Auto focus can go crazy at complete darkness. Then set the exposure time to B - BULB mode (camera shutter will be open as long as the shutter button remains pressed). 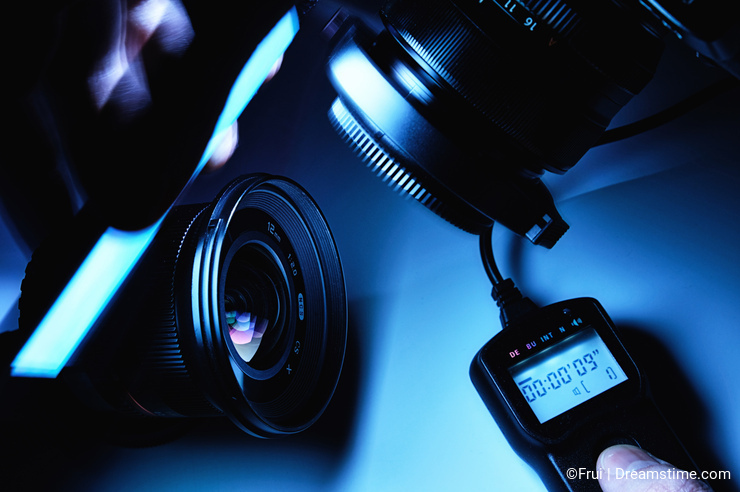 Exposure times can be up to a few seconds, so for minimizing camera shake is necessary wired or remote shutter release. Newer cameras allow also to trigger the shutter via Bluetooth or WiFi from smartphone, but our smartphone will be busy, so :) The last setting that is good to take into account is the white balance. Automatic White Balance works quite well and will perform well in most situations, but not always. If you notice a dominant blue color, change the balance to fluorescent, which matches the light temperature of smartphone screen. Let’s begin the creative part. Start the app, turn off room lights, press shutter button and start painting. Bear in mind that the light on the screen is "sharp", sometimes you will get better results by tilting the phone and painting only with the edge, not pointing straight at the object. You will quickly notice that it’s almost impossible to get the same results several times, and some parts look better, other not. Hint, paint just small areas and then merge fragments in Photoshop. Do not limit yourself to white light, the picture must attract attention, but do not overdo it, use other color as a beautifying accent. Did you know that this technique has been known for over 100 years? Many people use it to photograph cars and recently you can also hear about painting with light from the air, from the drone. It must be great fun. Prepare for unexpected :) some practices will be needed at the beginning. Thanks for your comment. Really nice post! I curious to test it! Thank you for your comment. I'm glad you found this article interesting.